Recently I was involved in a discussion around the concept of interoperability with WCF services. Half of our I.T. shop develops in the Java world and the other half in .NET, so as we were designing our next WCF service we asked ourselves the question, " Will this service ever need to be consumed by a Java client?" The answer to that question would make a difference in our design approach since we were told by our consultants friends that if we were to use custom data types in .NET, we were foregoing the opportunity for our Java teams from ever utilizing the service. We decided not worry about interoperability drawbacks and go ahead and design the service with custom .NET data types, generic lists, enums, etc. This will be an enumeration value of either "Soccer" or "Football"
As you will see the code for both platforms is very similar and there are only a couple of caveats to getting the solutions to work "out of the box", which we will discuss later. For the Java development, we will be using NetBeans IDE version 6.8 and for the .NET development, we will be using Visual Studio 2008. This article is the first in a three part series demonstrating the interoperability between .NET WCF services and Java Web Services. 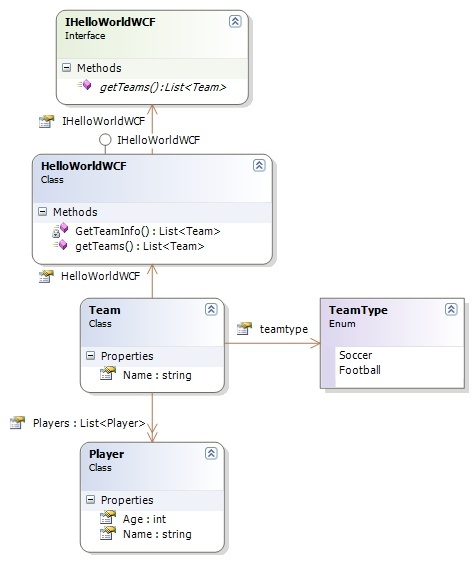 Nice tutorial to have pretty solid interoperability between JWS and WCF using custom data types, generic lists, and enums both ways! Thanks a lot for the allow me here . Yes I am agree with you this concept is really very good and I also read your old project which was also very useful windows 10 file explorer. Nice custom type of the data which has a good usefully.